Nothing Cleans Commercial Coils Like A Hurricane! 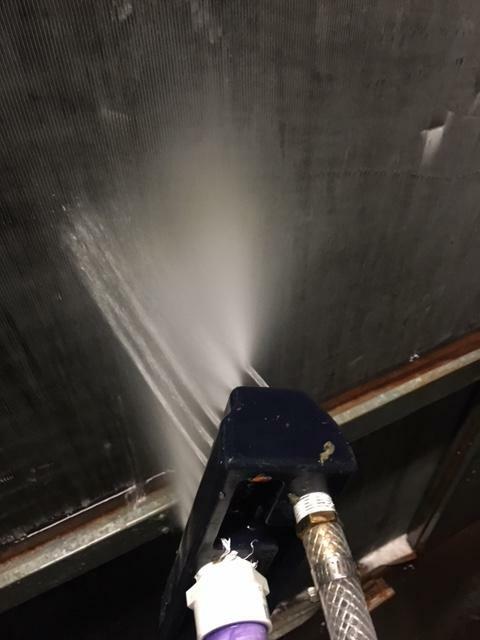 The patented Hurricane coil cleaning systems let you really clean those commercial coils! Dirty and clogged air conditioning and refrigeration coils (DX, chilled water, etc.) can be contaminated with dirt, debris, grease, seeds, bio-film etc. When neglected, these coils not only drastically increase the operating cost of the HVAC system they are also very challenging to clean. Most light weight coil cleaning systems are no match for the built up contamination deep inside these coils, especially multi-row coils. Better air flow and improved temperature transfer for better climate control and comfort. Drastically reduced pressure drop across the coil for significant reduction in energy consumption. In one case the pressure drop went from 2.6 inches to .391 inches (.33 inches was designed pressure drop). The savings on one 60 hp fan motor was $4,312.00 per year! Better serve your existing customers. Improve your productivity and profits. Have a real competitive advantage. If you are looking to expand your service offering, commercial coil cleaning is a great opportunity. Cleaning coils can greatly minimize compressor and fan wear while providing substantial energy savings. Remember, coil cleaning is not a one time job. Maintaining coils is a great ongoing opportunity! See the Hurricane Coil Cleaning System in Action!